BROWN 40” THERMOFORMER, DC SERVO DRIVE, C OVEN PLC CONTROL, AUTO LUBE, SPROCKETLESS RAILS. BROWN TP30 TRIMPRESS, SPEED CONTROL, AUTO LUBE SYSTEM. LYLE 40” THERMOFORMER W/GE PLC CONTROL, CLAMSHELL OVEN PLC CONTROL, UNWIND ROLL STAND, AUTO LUBE. BROWN TP10 TRIMPRESS, SPEED CONTROL, AUTO LUBE SYSTEM. LYLE 40” THERMO W/PLC CONTROL, SPROCKETLESS RAILS, CLAMSHELL OVEN PLC CONTROL, AUTO LUBE SYSTEM. LYLE T140, 40” TRIMPRESS, AUTO LUBE SYSTEM, SPEED CONTROL. BROWN 40” TERMOFORMER, GE PLC CONTROL, C OVEN PLC CONTROL, AUTO LUBE. 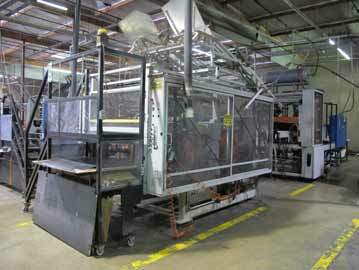 LYLE T140 TRIMPRESS SPEED CONTROL , AUTO LUBE, POWER FEED CANOPY. BROWN 40” THERMOFORMER, C OVEN PLC CONTROL, UNWIND ROLL STAND, AUTO LUBE. BROWN 4O” TRIMPRESS, AUTO LUBE SYSTEM ,FEED CONTROL. BROWN C-2101 28” THERMOFORMER, DC SERVO DRIVE, C OVEN PLC CONTROL, UNWIND ROLL STAND, AUTO LUBE SYSTEM. BROWN T-101 TRIMPRESS, AUTO LUBE, SPEED CONTROL. BROWN 27” HD821 THERMOFROMER, SPROCKELESS RAILS, CLAMSHELL OVEN PLC CONTROL, UNWIND ROLLS, AUTO LUBE. BROWN T100 TRIMPRESS, SPEED CONTROL, SPEED CONTROL, AUTO LUBE. BROWN 821 25” THERMOFORMER, C OVEN, UNWIND ROLL STAND, AUTO LUBE SYSTEM. BROWN 40” THERMOFORMER GE PLC CONTROL, DC SERVO DRIVE, C OVEN PLC CONTROL. 3) WORTEX 50” GRANULATOR UTP GRINDER. 4) WORTEX 30” GRANULATOR UTP GRINDER. RITE TEMP RTR-1004 CHILLER, S/N 504087012. LARGE SELECTION OF PARTS, GEARS, SPROCKETS AND RACKING. ACRA PROTOTRAK 3 AXIS CNC 3 HPMILL, WITH MX3 CONTROL, MODEL GS18V. 2) BRIDGEPORT VERTICAL MILLS WITH P.F. AND DRO. VARIOUS TOOLS, TOOLING, PARTS, AND SUPPORT. ALLIS CHALMERS 3000 LB ELECTRIC FORKLIFT. CLARK C-500 3000 LB LPG FORKLIFT. CLARK CGC-25 LB LPG FORKLIFT. 2) ATLAS GA37, 50 HP ROTARY AIR COMPRESSORS. 50 HP ROTARY AIR COMPRESSOR.